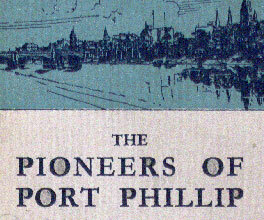 Published in 1935, The Pioneers of Port Phillip was an educational pamphlet designed to teach students about Victoria's early history and founders. Using important primary sources – including the writings of Garryowen and historian James Bonwick – it tells the story of familiar founders like John Batman and John Fawkner. For ages and ages black people lived in the Port Phillip country. They kept the same customs for generations, eating the same things and doing the same things, mostly because the men were lazy and despised hard work. Wilson, P St. J 1934, The pioneers of Port Phillip, Robertson & Mullens, Melbourne, Vic. While the pamphlet does set up stereotypes of Indigenous people that were common at the time, it does acknowledge that Aborigines were the traditional owners of the land – a fact that was ignored by Australian law until the Mabo case of 1992. The Port Phillip blacks did not know what this business [Batman's Treaty] really meant. [...] In return for some fairly useful presents, worth a few pounds at the most, they had given away 600,000 acres of land! It sounds funny, and you may laugh, but other white men did not even bother to give the blacks that much. They simply drove the old owners away and took their hunting land without asking permission. During the 1930s, around the centenary of settlement, there was a tendency to glorify the first European settlers, and a reluctance to focus on the complex issues of Port Phillip's settlement – including the effect of settlement on Indigenous people and their way of life. This paragraph paraphrases a section in James Bonwick's Early Days of Melbourne, written in 1857, where he also discusses the injustice of the treaty and describes Aborigines as the ‘real owners of the soil'. Despite such occasional references to the role of Indigenous people before European settlement, educational texts like The Pioneers of Port Philip continued to highlight only one version of history, which began with men like Fawkner and Batman. Melbourne's population in the 1800s reflected the city's growth as a bustling metropolis. It lacked the complexity of newspapers today, but Fawkner's ‘rag' was the beginning of Melbourne's media.